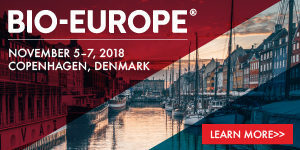 BIO-Europe® 2018 – Additional Discount ! Please register by August 31st (end of early bird deadline) to achieve the early bird discount of 200 EUR + the additional discount of EUR 300 for DANSK BIOTEK members. A new registration page will be introduced after June 8th or soon after that date. It will be very apparent when the switch to the new registration pages has happened as delegates will then be asked to pay the registration fee online unlike in the past when the invoice with payment instructions was emailed a few days after registration. The code is “DanskBiotek2018” and will need to be entered into the “VIP code” instead of the “comments” field which will no longer exist in the new registration pages. The code must be entered exactly as noted above as the system will not recognize any variations of it. In other words, the code needs to be entered into the “comments” field until the switch to the new registration pages and then into the “VIP code” field once the new pages are live.